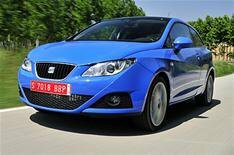 First drive: Seat Ibiza SportCoupe | What Car? With the best will in the world, Seat is stretching things by calling its new three-door Ibiza a 'Sport Coupe. Firstly and most importantly, its not a coupe, and secondly, until it gets some spunkier engines, its anything but sporty. Lets ignore the marketing manure for the moment, though, and concentrate on the car's positives. The Sport Coupe is based on the same all-new chassis as the five-door Ibiza, albeit a tad shorter, so the car's handling and ride quality are hard to fault. The steering is a bit vague, but the body is smoothly controlled over lumps and bumps and the suspension is so quiet that it lends the SportCoupe a real big-car feel. That impression is enhanced by the amount of space in the front and a boot that will easily carry enough camping equipment for a weekend of festival fun. Unfortunately, that rakish roof line and tight rear legroom mean that if you want to take a couple of mates along, therell be plenty of arguments over who has to sit in the back. Thankfully, the pricing of the SportCoupe is also on the tight side. Expect it to be £300 cheaper than the already-keenly priced five-door and undercut rivals such as the Vauxhall Corsa and Renault Clio by several hundred pounds. Come the New Year, the Ibiza will get the latest 1.4 TSI petrol engines and, to be honest, they cant come a moment too soon. For now, youre limited to a 1.2-litre three-cylinder engine, as well as 1.4- and 1.6-litre four-cylinder motors. Diesel power is best provided by a 1.4-litre three-cylinder engine, and rumour has it that Seat UK will ditch the rattly old 1.9-litre version that we drove on the original five-door launch. None of the engines are particularly powerful or quiet, and all feature tall gearing to reduce carbon dioxide emissions and increase fuel economy. Thats fine in theory, but in practice you spend so much time down-shifting to access what power there is that youll struggle to match the claimed fuel economy figures. Hopefully, the 1.4 TSI engines will address these shortcomings. Expect 120bhp for the standard cars, 150bhp for the FR models and a turbocharged and supercharged 180bhp Cupra version to add some much-needed pep to the range. • The Ibiza SportCoupe goes on sale in September, costing from £8995 to £11,295 (tbc).